Note: sorry for the lack of photos. Will post more when we have better internet. The weather continues to delay our travel. We were up at 0600 for an early departure to Nassau. Checking the radar we see storms brewing off the Florida coast heading toward the Bahamas. It’s decision time. Do we go or do we stay. We decide to delay our departure and let the storms pass. Betty and Jill, aboard LiLi, decide to push off ahead of the storms. They are going to Chub today. With our delayed departure, we now plan on anchoring at Chub also. There won’t be enough daylight to make Nassau. By 11:00 AM the storms have passed and we are soon through the narrow rock wall cut of Great Harbour. Heading southwest on the Bahama Bank, we find the seas quite bumpy with 3-4 footers on our starboard beam. This wasn’t in the forecast. We are now questioning our decision to leave at all today. The seas continue to build making for a long day. We finally get a reprieve once we turn to port and now have a following sea. Northwest shoal lite, a plain metal stake rising 20 feet out of the water marks our safe passage through the shoal. Once across the shallow reef, our depth goes from 20 feet to over 1800 feet. We are now in the Northwest Channel. Tonight’s anchorage is Behind Frazer’s Hog Cay. Betty and Jill aboard LiLi are already anchored. Two other Krogens,Galactic and Salt N Light, are on their way here also after crossing the Gulf Stream two days ago. 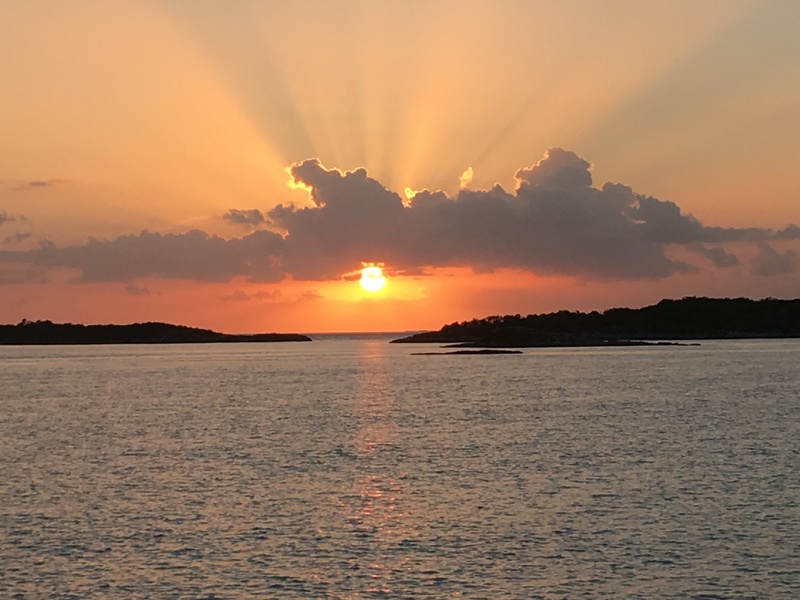 After looking at the charts we decide to continue a mile or so further to The Whale Cay anchorage. We plan on leaving tomorrow morning in the dark and this anchorage exits directly to deep water with no hazards to navigate. The other three Krogens spend the evening at Frazier Hog. They plan on spending the day tomorrow shelling on a nearby beach. 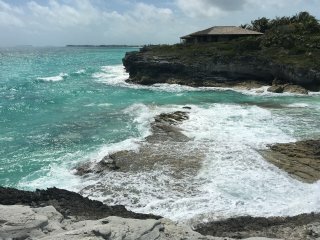 Whale Cay looks like it would be an interesting place to explore. We are anchored off a nice beach with a small lighthouse perched on the hill. Our plan is to depart for Nassau around 4:00 AM so it’s early to bed. Yesterday was not a good day. In fact it is high up there as one of the worst days on the water that we have had in a long time. The day started off very well. Our new FLIR guided us safely through the early morning darkness out of the Whale Cay anchorage at promptly 5:00 AM. Entering the deep 2000 foot waters of The Northwest Passage, we are pleased to find calm seas. As daylight approached, we deployed the fishing lines in hopes of a Mahi. We troll two cedar plugs for the next two hours without even a strike. Reaching the familiar cruising grounds off West Nassau, we pull in the lines as the depth shallows. The weather forecast is for thunderstorms later today. We see some storms off to our west but they appear to be going the other way. Do we anchor here in Nassau or continue on? The calm seas are perfect for continuing on to the Exumas and it is early in the day so we make the decision to push on. In hindsight, this turned out to be a very bad decision. This 35 mile leg of our trip takes us over the White Bank, a shallow 15 ft. deep sandbank with coral heads lurking just beneath the surface. This area needs to be traveled in good daylight so the coral heads can be seen. Our crossing of the White Bank is pleasant with only one to two foot seas. A few hours into the trip, things begin to deteriorate. A massive thunderstorm catches us with seas building to five foot. The winds are now blowing 20 to 30 knots. The sea state is like a washing machine with waves coming at us in all directions. Cabinets down below begin spilling their contents as our boat pitches forward and aft and rolls from side to side. As we are searching for a safe anchorage our visibility goes to zero. Radar shows the storm cell directly over us and moving at the same speed we are. We continue running with the seas which is at least better than going into them. Several big mega yachts(150+ feet) heading the opposite direction have deployed their anchors and have come to a halt. The storm stays right over us for the next hour and waves continue to pound us. We head for a small island in hopes we can hide behind its protection. One sailboat is anchored there but is violently being tossed from side to side.The surge is wrapping around both sides of the island making it unacceptable as an anchorage. 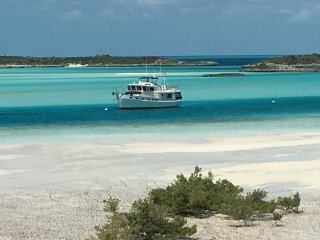 Shroud Cay,part of the Exuma Land and Sea Park, is our next and only other option. There are mooring balls available here but there is no way we could pick up one of these balls with the now 40k winds. As we try to deploy the anchor,Idyll Time is violently being tossed from side to side. Luckily,our trusty Bruce anchor grabs the first time. Jeff manages to deploy our flopper stopper over the side which helps reduce our roll. This spot is far from ideal. We have little protection from the blowing north wind but are very glad to be here. Three mega yachts anchor just to our port side. We spend most of the evening up in the pilot house hoping that our anchor holds. Finally around midnight the winds subside to 20 knots and we feel more secure that our anchor will not drag. Up this morning at first light, we again start our search for a more protected anchorage. The forecast for the next three days is for unsettled weather with strong gusting winds up to 30 knots each day. After several emails to other Krogens in the area, we have four possible anchorages further south in mind. The best and only completely protected spot is Warderick Wells North Mooring field which is home to the Exumas Land and Sea Park headquarters. Moorings are assigned by the park on a first come first serve basis each morning at 9:00AM on the VHF channel 9 from the previous day’s request. We feel certain that all of these moorings will be taken. Boaters wait for days to get a ball assignment in the park.. Listening in on the 9:00 AM departures, we here at least three boats call in to the park that they are leaving. There might be some hope for us after all. Next are the calls requesting a mooring. Several boats jump in ahead of us and are assigned balls. We are the third call in and hold our breath as the ranger ask our length and draft. It is our lucky day, there is a spot for us. The park ranger says to call back as we approach the mooring field. .
An hour later finds us nearing the mooring field and we call for a ball assignment. The ranger assigns us ball #9 and gives detailed instructions on entering the mooring field. As if we hadn’t had enough stress, picking up a ball here will make your heart race. The mooring field is a narrow channel no more than 100 ft wide with the boats moored one behind the other. There are sandbars on both sides and a three knot current running through the field. No room for error here as we navigate around the tethered sailboats to our assigned ball. After some difficulty with current and wind, we manage to secure Idyll Time to the ball on the first try. We had our difficulties attaching to the pendant but everything is good now. It’s time to enjoy the incredible beauty of the Exumas. This entry was posted on April 15, 2016 at 11:25 am. You can follow any responses to this entry through the RSS 2.0 feed. You can leave a response, or trackback from your own site.